Promasidor Nigeria Limited has been commended for extending its corporate social responsibility initiative, “Harness Your Dream” to Enugu State. In his goodwill message at the fourth edition of the career guidance programme, which was held at Queen’s School, Enugu, the state Commissioner for Education, Prof. Uche Eze expressed deep appreciation to Promasidor, makers of Cowbell Milk, Loya Milk, Miksi Milk, Top Tea, Onga and other quality products, for adding value to the students, drawn for JS 3 classes of the host and neighbouring schools. The commissioner, who was represented by Mrs Chidiogo Ugodu said that the impact of the project would be felt in the years ahead of the beneficiaries, who would now be able to make the right career choices. Speaking to newsmen afterwards, Ugodu urged Promasidor to consider extending “Harness Your Dream” to other schools in the state, particularly those in the rural communities. “I have harnessed my dream today. With this programme, the students now know about other career choices. 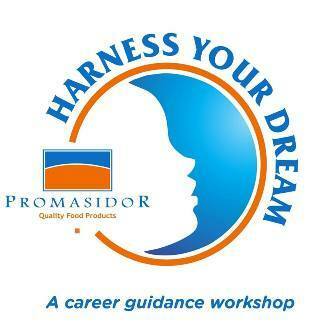 Promasidor, we thank you for coming to Enugu. We thank you for adding value to us. We will like you to extend this programme to other parts of the state,” Ugodu further said. The Deputy Director, Guidance and Counselling at the Ministry of Education, Mr Lazarus Ude; and the Principal of Queen’s School, Enugu, Mrs Ada Nweke also thanked Promasidor for extending the programme to the state. “You did not make any mistake by choosing our state as one of your catchment zones. Our amiable governor is education friendly. He always want to see children achieve their aims in life,” Nweke said. The celebrity appearance by the Aneke Twins heightened the interest of the students in the programme. Chidinma and Chidiebere Aneke, Nollywood actresses and humanists who founded the Aneke Twins Foundation, inspired the students with the moving story of how they lost virtually everything when their father died while they were in their teens, and how they battled against rejection by family and friends. Earlier, the Managing Director of Promasidor Nigeria Limited, Mr. Anders Einarsson said that the company is deeply committed to supporting Nigerian youths in fulfilling their potentials, adding that the motivation for the initiative to guide students to choose careers that match their talents, skills and aspirations. “We specifically target your class because by next session, you will be selecting relevant subjects that will determine your future careers,” explained Einarsson, who was represented by the company’s Head of Legal and Corporate Communications, Mr Andrew Enahoro. He encouraged the students to take advantage of other projects by Promasidor, including Cowbellpedia Secondary School Mathematics Television Quiz Show, which is sponsored by the company’s flagship brand, Cowbell. Einarsson recalled the feat of Munachi Ernest-Eze, who in November last year added the senior category of the Cowbellpedia Mathematics competition to the junior category he had won two years previously. “Munachi’s exceptional performance is a story of dedication, discipline and devotion. And this is the path you should follow,” the Managing Director admonished. He also stated that the Loy a Swim Meet, which has just concluded its third edition, helped to support the sports development aspirations of hundreds of youths. “These initiatives are not inspired by excess funds as we have limited resources like every other company. The difference we have make lies in our genuine passion in assisting you to achieve your dreams,” he explained. In an interview with newsmen, Enahoro said that Promasidor Harness Your Dream is encouraging the spirit of hard work among young Nigerians. He said the choice of courses taught at the programme was skewed towards helping the benefitting students ultimately becoming gainfully employed and useful to themselves and the society. “Next year, we are going to change the syllabus because this one has run for a whole year. We will like to incorporate other professions and careers into the programme,” he hinted. Promasidor staff, who served as resource persons, shared their educational and career experiences with the students and explained how to become professionals in several disciplines. These are: Personnel Management and Emerging Entrepreneurial Opportunities, and Information and Communication Technology. Others are: Accounting and Business Management, and Digital Marketing. A CSR initiative of Promasidor Nigeria Limited, Harness Your Dream has been held in Lagos and Ogun States, as well as the Federal Capital Territory, Abuja since it was launched in November last year. It is a pan-Nigeria project, which is held every school term. The primary objective of “Harness Your Dreams” is to help public school students understand varieties of career options and guide them along their career paths.